MOLLUSCA : NUDIBRANCHIA : Aldisidae SNAILS, SLUGS, ETC. Description: The mantle of Aldisa zetlandica is usually white (has been reported as greenish-grey) in colour and bears rounded tubercles. The gills and rhinophores are white in colour. The sides of the foot are tall and the gut may show through the foot as a purple mass. The gills are bushy and fully retractile into a pocket. Individuals may reach a length of up to 35 mm. Habitat: A sublittoral species known originally from dredging in deep water in Shetland. Recent finds have been in a sponge rich area amongst a variety of Axinellid sponges where Aldisa feeds on the species Hymedesmia paupertas and Hymedesmia jecusculum. Distribution: A rare species reported from Shetland to the Azores. Recent finds in the British Isles have been from Achill Island and Skird Rocks in Galway, where it has been collected on several occasions. In southern Norway it can be frequent at some sites. Similar Species: The only other white dorid likely to be confused with this species is Cadlina laevis which is much flatter in profile. 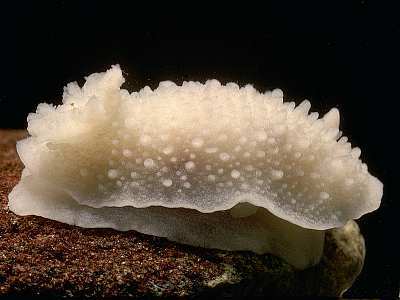 Small individuals could be confused with Adalaria or Onchidoris muricata but these species have separately contractile gills and no true gill pocket. White body with rounded profile. Picton, B.E. & Morrow, C.C. (2016). Aldisa zetlandica (Alder & Hancock, 1854). [In] Encyclopedia of Marine Life of Britain and Ireland.